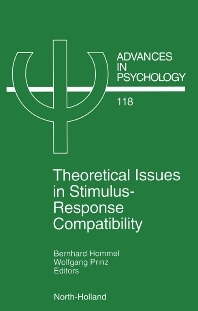 Theoretical issues in stimulus–response compatibility: editors' introduction (B. Hommel, W. Prinz). 1. Differentiating types of set–level compatability (R.W. Proctor, H. Wang). Commentary on Proctor and Wang (S. Kornblum). Commentary on Proctor and Wang: A requiem for simplicity? (E.-J. Stoffels). 2. The lateralized readiness potential as an on–line measure of automatic response activitation in S–R compatibility situations (M. Eimer). Commentary on Eimer: Stimulus–response compatibility and the lateralized readiness potential (H. Leuthold). 3. Correspondence effects for irrelevant information in choice–reaction tasks: Characterizing the stimulus–response relations and the processing dynamics (C.-H. Lu). Commentary on Lu: A dual–route processing architecture for stimulus–response correspondence effects (K.R. Ridderinkhof). 4. The relevance of salience: Towards an activational account of irrelevant stimulus–response compatibility effects (P. Barber, M. O'Leary). Commentary on Barber and O'Leary: Learning and attention in S–R compatibility (C. Umiltà, M. Zorzi). 5. Spatial stimulus coding and the focus of attention in S–R compatibility and the Simon effect (T.H. Stoffer, C. Umiltà). Commentary on Stoffer and Umiltà: Focus–related or fovea–related spatial codings? (J. Müsseler). Commentary on Stoffer and Umiltà: Attention in stimulus–response compatibility (D.J. Weeks, R. Chua, A. Bautista). 6. Compatibility effects on performance and executive control in dynamic task settings (R. de Jong). Commentary on De Jong (H. Pashler). 7. Why Donders has led us astray (W. Prinz). Commentary on Prinz (A. Ehrenstein). Commentary on Prinz: Action codes or informationally guided movements? (J.F. Stins). 8. Toward an action–concept model of stimulus–response compatibility (B. Hommel). Commentary on Hommel (R.W. Proctor). 9. An ecological approach to stimulus–response compatibility (C.F. Michaels, J.F. Stins). Commentary on Michaels and Stins: Promises and problems of an ecological approach to S–R compatibility (W. Ehrenstein). Commentary on Michaels and Stins: On the necessity and benefit of a theory of stimulus and response for Sndash;R compatibility (Y. Lippa). 10. Dynamical explorations of compatibility in perception–action coupling (R. Chua, D.J. Weeks). Commentary on Chua and Weeks: Dynamic conditions and accounts of stimulus–response compatibility (W.H. Ehrenstein). Author Index. Subject Index. This book gathers together 10 important integrative theoretical approaches to stimulus-response compatibility, a field of special interest for the more general question of how human perception and action interact. The approaches, presented by their most active and influential proponents, as well as the sharp and critical commentaries also included in the book, cover a wide range of theoretical schools of thought and a rich body of empirical data. These highly stimulating papers and sharp comments offer both the theoretically interested professional and the student reader not only a comprehensive overview of the state of the art, but excellent insights into work in progress as well. This volume is an important contribution to the deeper understanding of the sensory-motor interface.